The Winnipeg Jets host the St. Louis Blues tonight in Game 1 of their best-of-seven Stanley Cup Playoffs first round series…The Jets beat the Arizona Coyotes 4-2 on Saturday in the last day of the regular season to secure home ice in the series…Game 2 of the series is slated for Friday, also in Winnipeg, before the series shifts to Enterprise Center in St. Louis for Game 3 on Sunday and Game 4 on Tuesday. The Jets are back in the Stanley Cup Playoffs for the second consecutive season…It’s the first time in franchise history that the Jets have reached the playoffs in back-to-back seasons and fourth time overall. Tens of thousands of white-clad Jets fans are expected to cheer on the Jets inside Bell MTS Place and outside the adjacent street party tonight…The Jets had one of the best home records in the NHL during the regular season at 25-12-4…Last season in the playoffs, the Jets went 5-3 on home ice, including winning their first four home games. The Jets were 3-0 in Game 1s in last season’s Stanley Cup Playoffs…The Jets beat the Minnesota Wild (3-2), Nashville Predators (4-1), and Vegas Golden Knights (4-2) in Game 1 of their respective series…The Jets franchise had lost their two Game 1s prior to last season…Blake Wheeler leads the Jets in scoring in Game 1s with six points (6A) in four games, while Mark Scheifele has five points (4G, 1A) in four games…Goaltender Connor Hellebuyck went 3-0 in Game 1s last season with a 1.67 goals-against average and .944 save percentage. This is the sixth playoff series in franchise history and the sixth time the Jets face a different opponent…The then-Atlanta Thrashers played the New York Rangers in 2006…The Jets made the playoffs for the first time after relocation in 2015 and met the Anaheim Ducks in the first round…Last season, Winnipeg played the Minnesota Wild, Nashville Predators and Vegas Golden Knights. The Jets went 13-12-1 against Central Division teams during the regular season, which is their poorest divisional record since going 11-16-2 during the 2015-16 season…Winnipeg has been above .500 against their divisional foes in four of six seasons since moving to the Central Division…Winnipeg finished the season 4-7-1 in their last 12 games against Central Division teams and three of the four wins came against Nashville…Since the start of the 2016- 17 season, the Jets are 47-29-5 against Central Division teams, which is second in the NHL…In that same time frame, Blake Wheeler leads all NHLers in scoring against the Central Division with 98 points (28G, 70A) in 81 games, while Mark Scheifele has 90 points (37G, 53A) in 73 games. Jets head coach Paul Maurice is coaching in the postseason for the seventh time in his career…Maurice is 34-40 behind the bench in playoff games, with the highlight of his postseason success coming in 2002 when he coached the Carolina Hurricanes to the Stanley Cup final…The nine playoff wins the Jets posted last season is the second most Maurice has had in a playoff run, next to the 2002 season. Mark Scheifele finished the playoffs last season with 14 goals in 17 games…He set an NHL record for most road goals in a playoff series with seven tallies in the second round against the Nashville Predators…He had a pair of goals in each of Game 1, 2 and 7 in Nashville…He had a four-game goal scoring streak from Game 4 at Minnesota in the first round to Game 2 at Nashville in the second round (Apr. 17-29)…Scheifele scored 33.3% of the Jets goals in the playoffs and had a 31.1% shooting percentage. Dustin Byfuglien is the only player on the Jets roster to score an overtime goal in the Stanley Cup Playoffs and happened nearly a decade ago…Byfuglien did it during his time with the Chicago Blackhawks in Game 3 of the Western Conference Final against the San Jose Sharks…The Jets franchise has never won a playoff game in overtime, going 0-2 thus far. This will be the first time the Winnipeg and St. Louis have met in the Stanley Cup playoffs in Jets 2.0 history. The Blues eliminated the original Jets in four games in the Norris Division Semifinal back in 1982. The Jets won three of four games during the regular season against the Blues, outscoring St. Louis 18-10. The Jets have won four of their past five regular season games against the Blues and 12 of their last 14 meetings. The Jets are 14-11-3 against St. Louis since the franchise relocated to Winnipeg in 2011. The Jets have a power play goal in six of their past seven games against the Blues (6-for-31, 19.4%). Winnipeg is 28-for-33 (84.8%) on the penalty kill in their past 11 regular season games against St. Louis. Kyle Connor (1G, 6A), Patrik Laine (6G, 1A), and Mark Scheifele (2G, 5A) tied for second in the NHL in regular season in scoring against St. Louis with seven points in four games. Laine’s six goals is the most against the Blues in a single season in 10 years and his five-goal game in November was the fifth time in NHL history that a player has scored five goals in a game against St. Louis. 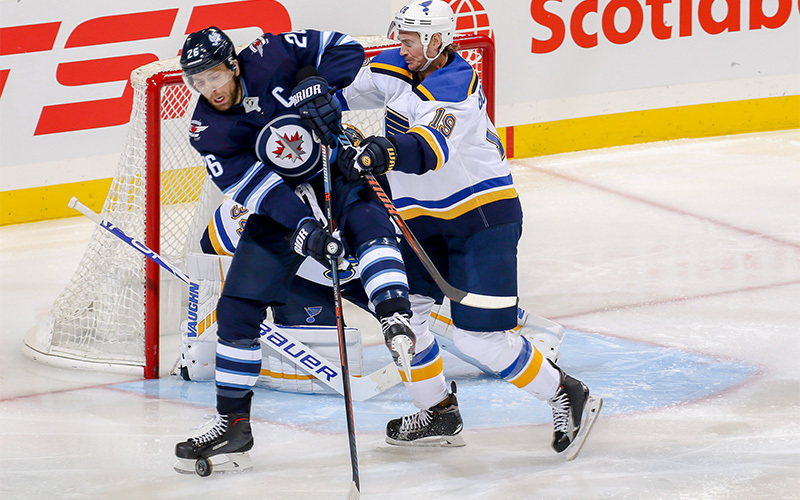 Blake Wheeler leads the Jets in career scoring against the Blues with 35 points (14G, 21A) in 31 games, while Mark Scheifele has 24 points (10G, 14A) in 25 games. Goaltender Connor Hellebuyck is 6-3-0 against the Blues with a 1.66 goals-against average and a .943 save percentage. Blues’ assistant captain Alexander Steen was born in Winnipeg. His father, Thomas Steen, played 14 seasons for the original edition of the Winnipeg Jets (1981-95). Blues defenceman Joel Edmundson is from Brandon, Man. Winnipeg’s Josh Morrissey and St. Louis’ Robby Fabbri won a gold medal together playing for Canada at the 2015 World Junior Championship. Winnipeg’s Mark Scheifele and Josh Morrissey won a silver medal with St. Louis’ Colton Parayko at the 2017 IIHF World Championship. Jets forward Mark Scheifele and defenceman Josh Morrissey were teammates with Blues forward Brayden Schenn playing for Canada at the 2017 World Championship, winning a silver medal.